The Great Mosque of Kufa, or Masjid al-Kūfa (Arabic: مسجد الكوفة المعظم/الأعظم‎), or Masjid al-Mu'azam/al-A'azam located in Kūfa, Iraq, is one of the earliest and holiest surviving mosques in the world. The mosque, built in the 7th century, contains the remains of Muslim ibn ‘Aqīl - first cousin of Imām Husayn ibn ‘Alī, his companion Hānī ibn ‘Urwa, and the revolutionary Mukhtār al-Thaqafī. Sources attribute the construction of the Great Mosque of Kufa in the middle of the 7th century to the Caliph Omar. There is a legend that says the edifice was built on a temple constructed by Adam while another claims that Adam's bones were buried on the site, having been carried by Noah on board the Ark. It is also believed that the angel Gabriel was referring to the mosque when he declared, "Twelve miles of lands from all directions of the mosque are blessed by its holiness." 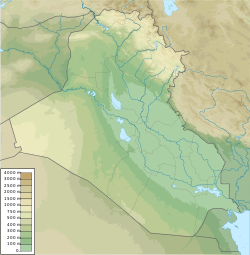 The site was identified in Shia Islam as the place where Noah must build his Ark. The family members of the first Shiite imams and their early supporters were buried within. Architectural excavations revealed that the mosque, which dates from 670, was built on top of much older foundations. The area of the building measures approximately 11,000 square metres (120,000 sq ft). The mosque contains nine sanctuaries and four traditional locations. As to its design, experts recognized similarities to the design of the palaces of pre-Islamic Persia. It has four minarets and is accessible through five gates: Gate of the Threshold (Bāb al-Sudda), Gate of Kinda (Bāb Kinda), Gate of al-Anmat (Bāb al-Anmāṭ), Gate of the Elephant (Bāb al-Fīl), also known as the Gate of the Snake (Arabic: باب الثعبان‎, translit. Bāb al-Thu‘bān)., and Gate of Hani ibn Urwa. Decorations with gold and silver and precious stones such as diamonds, rubies and in every corner of the mosque one will find Ya Ali written. The mihrab, where Ali ibn Abi Talib was killed, has been made with a gold zari. It is composed of gold, silver, rubies, diamonds. The whole interior of the mosque has verses of the Quran surrounded in gold in Arabic calligraphy. In the section of the mihrab are tear-shaped engravings in marble, bordered with gold and rubies. The courtyard is covered in white marble from Makrana, India. It was the place where ‘Alī was fatally wounded by a poison-coated sword while prostrating in the Fajr prayer. Imām Ja‘far as-Sādiq said that up to twelve miles of land in all directions from the mosque are blessed by its holiness. Imām Ja'far al-Sadiq was also recorded as remarking that the "mosque in Kufa is superior to that of Jerusalem" and that "performing two prostrations of prayer here would be better for me than ten others at any mosque." The secretariat of Al-Kufa Mosque and its shrines describes the mosque as being one of the sole four dignified mosques to which Muslims must travel, and that it comes in third place after the Kaaba and the mosque of Prophet." According to Shia belief, it is from this mosque that the messianic final Imam, Muhammad al-Mahdi, will rule the world from, and it will serve as the seat of his power in the end of times. ^ "Hundreds of thousands' Friday assemblage in Masjid-e-Uzma Kufa". Jafariyanews.com. Retrieved 20 November 2008. ^ a b Costa, Nicholas (2013). Adam to Apophis: Asteroids, Millenarianism and Climate Change. D'Aleman Publishing. p. 194. ISBN 9789963291700. ^ a b c Marshall Cavendish Reference (2011). Illustrated Dictionary of the Muslim World. Marshall Cavendish. p. 152. ISBN 9780761479291. ^ a b "General Facts and Numbers". The Official Website of Secretariat of Al-Kufa Mosque and it Shrines. Archived from the original on 2010-07-31. Retrieved 2009-03-01. ^ Sindawi, Khalid (2008). "Mītham b. Yaḥyā al-Tammār: an important figure in early Shī'ism". Al-Qanṭara. 29 (2): 269–291. ISSN 0211-3589. ^ "باب‌الثعبان هذا الاسم الذي حاول بنو أمية ومن تلاهم تغييره ولم يستطيعوا و بقي رمزا لمسجد الكوفة ومنقبة من مناقب الإمام علي (عليه السلام)". Official website of Great Mosque of Kufa. Archived from the original on 19 September 2013. Retrieved 18 June 2016. ^ "تو دستگير شو اي خضر پي خجسته". ISNA Fars. Archived from the original on 17 May 2016. Retrieved 18 June 2016. ^ Bosworth, Clifford (2007). Historic Cities of the Islamic World. Leiden: BRILL. p. 295. ISBN 9789004153882. ^ a b Kartikeya (21 March 2010). "Bohras help War-ravaged Kufa get back its glory". Times of India. ^ a b c "The Establishment of the Mosque". The Official Website of Secretariat of Al-Kufa Mosque and it Shrines. Archived from the original on 2010-07-31. Retrieved 2009-03-01. ^ al-Qummi, Ja'far ibn Qūlawayh (2008). Kāmil al-Ziyārāt. trans. Sayyid Mohsen al-Husaini al-Mīlāni. Shiabooks.ca Press. pp. 66–67. ^ Gold, Dore (2007). The Fight for Jerusalem. Regnery. p. 91. ISBN 978-1-59698-029-7. ^ al-Qummi, Ja'far ibn Qūlawayh (2008). "8". Kāmil al-Ziyārāt. trans. Sayyid Mohsen al-Husaini al-Mīlāni. Shiabooks.ca Press. p. 47. ^ al-Qummi, Ja'far ibn Qūlawayh (2008). "8". Kāmil al-Ziyārāt. trans. Sayyid Mohsen al-Husaini al-Mīlāni. Shiabooks.ca Press. p. 44. Wikimedia Commons has media related to Great Mosque of Kufa. This page was last edited on 16 March 2019, at 20:10 (UTC).